Tesla Motors said Tuesday it would offer to buy SolarCity for between $2.59 billion and $2.78 billion worth of its stock in a bid to accelerate the world’s transition to energy sustainability. The only missing piece from Tesla's equation was tying clean energy source to its fleet of vehicles and its Powerwalls and PowerPacks. A logical step to complete its master plan. The company will be able to reduce the costs of installing solar panels to Tesla customers in the future. This will maximize and build on the core competencies of each company, according to their blog post. Tesla’s experience in design, engineering, and manufacturing should help continue to advance solar panel technology. Similarly, SolarCity’s wide network of sales and distribution channels and expertise in offering customer-friendly financing products would significantly benefit Tesla and its customers. SolarCity shares popped more than 26 percent Tuesday after hours on the offer of $26.50 per share to $28.50 per share, while Tesla shares dipped more than 10 percent. SolarCity intends to carefully evaluate the proposal, it said in an SEC filing. Elon Musk is the chairman of the board of directors at SolarCity. "There are tremendous synergies between these two companies," Lyndon Rive, co-founder and CEO of SolarCity, wrote in an email to SolarCity employees. "You should know that the board and the shareholders will be considering this, and so while I am personally excited, I will be recusing myself from the decision-making process. Ultimately, the shareholders will decide." The SolarCity team has built its company into the clear solar industry leader in the residential, commercial and industrial markets, with significant scale and growing customer penetration. They have made it easy for customers to switch to clean energy while still providing the best customer experience. We’ve seen this all firsthand through our partnership with SolarCity on a variety of use cases, including those where SolarCity uses Tesla battery packs as part of its solar projects. 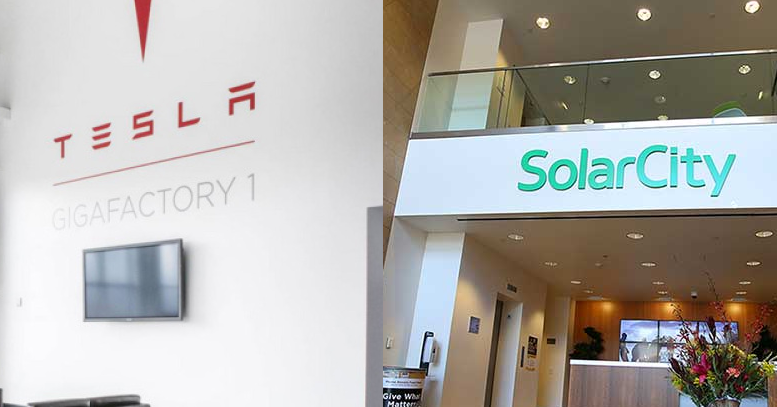 So, we’re excited to announce that Tesla today has made an offer to acquire SolarCity. A copy of Tesla’s offer is provided below. Today’s offer to acquire SolarCity is only the first step toward a successful combination of Tesla and SolarCity. We will provide a further update if and when an agreement is reached. We are pleased to submit to you and the SolarCity board of directors a proposal to acquire all of the outstanding shares of common stock of SolarCity in exchange for Tesla common shares. Subject to completing due diligence, we propose an exchange ratio of 0.122x to 0.131x shares of Tesla common stock for each share of SolarCity common stock. This proposal represents a value of $26.50 to $28.50 per share, or a premium of approximately 21% to 30% over the closing price of SolarCity’s shares, based on today’s closing price of SolarCity’s shares and the 5-day volume weighted average price of Tesla shares. We believe that our proposal offers fair and compelling value for SolarCity and its stockholders, while also giving SolarCity’s stockholders the opportunity to receive Tesla common stock at a premium exchange ratio and the opportunity to participate in the success of the combined company through their ongoing ownership of Tesla stock. The board of directors of Tesla is excited at the prospect of a potential combination of SolarCity’s business with Tesla. We believe that the possibilities for product, service and operational synergies would be substantial, and that a combination would allow our companies to build on our respective core competencies and remain at the forefront of delivering innovative approaches for sustainable transportation and energy. We believe that a combination would generate significant benefits for stockholders, customers and employees of both Tesla and SolarCity. We are committed to a possible transaction that is fair to SolarCity’s and Tesla’s respective stockholders. To help ensure that, Tesla is prepared to make the consummation of a combination of our companies subject to the approval of a majority of disinterested stockholders of both SolarCity and Tesla voting on the transaction. In addition, as a result of their overlapping directorships, Elon Musk and Antonio Gracias have recused themselves from voting on this proposal at the Tesla board meeting at which it was approved, and will recuse themselves from voting on this proposal at the SolarCity board as well. We believe that any transaction should be the result of full and fair deliberation and negotiation by both of our boards and the fully-informed consideration of our respective stockholders. Our proposal is subject to the satisfactory completion of due diligence, the negotiation of mutually agreeable definitive transaction documents, and final approval by the Tesla board. While a transaction would be further subject to customary and usual closing conditions, we believe that Tesla is well positioned to negotiate and complete the transaction in an expedited manner. We do not anticipate significant regulatory or other obstacles in consummating a mutually beneficial transaction promptly. In light of Elon Musk’s SEC disclosure obligations in his individual capacity as a stockholder of SolarCity this proposal will be publicly disclosed, but Tesla’s intention is to proceed only on a friendly basis. We look forward to discussing a potential transaction with you, and hope to expeditiously enter into a definitive agreement.